Upcoming Fantasy and Sci Fi Books: November 2016 | Nerd Much? The cold weather is coming for most of us, and if you’re like me, that means hibernating until spring with a stack of books. If you’ve been keeping up with my monthly recommendations, chances are you’ve got a lengthy TBR list already; however, let me add a few more to that list for you (#sorrynotsorry). As always, this list of upcoming fantasy and sci-fi books includes a variety of new releases spanning the fantasy and sci-fi genres, so there should be something that appeals to everyone. This month will see many continuations of established series, but there is also a fantastic-looking debut and a collection of short stories edited and contributed to by a wildly popular fantasy author. If you missed last month’s list of upcoming sci-fi and fantasy books, you can check it out here. Sharon Shinn has created a believable yet magical world with engaging characters and a strong romantic component; so if fantasy romance is what you’re looking for, you should give her Elemental Blessings series a try, beginning with the first book, Troubled Waters. The Burning Isle is the debut novel by Will Panzo that has gotten a lot of attention recently and was named one of Barnes and Noble’s 10 Science Fiction & Fantasy debuts to watch for in the second half of 2016. It’s a grimdark fantasy that follows a mage named Cassius following his arrival on the island of Scipio, which is a haven for criminals, pirates, and exiles. Each half of the city is ruled over by two competing warlords who both answer to the same mysterious general residing deep in the jungle. Cassius was trained on the Isle of Twelve, and he may be able to use this feud to his advantage; however, he seeks more than just monetary gain. 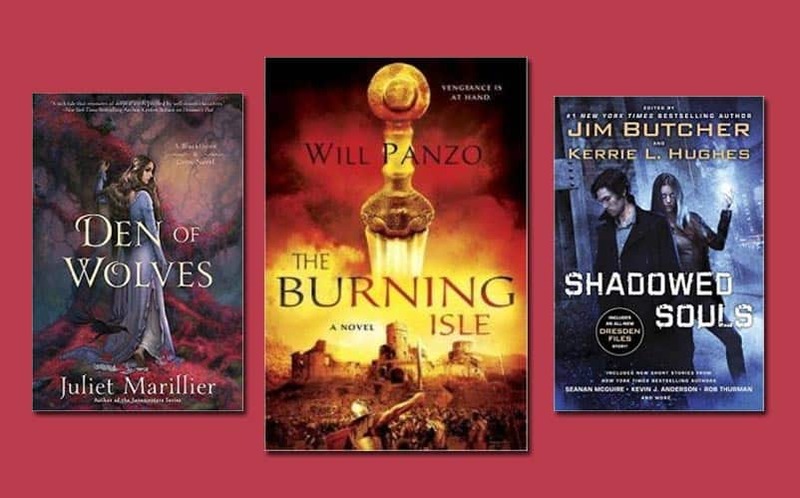 The intricate plot, variety of intriguing characters, and interesting world-building combine to make The Burning Isle a memorable debut. 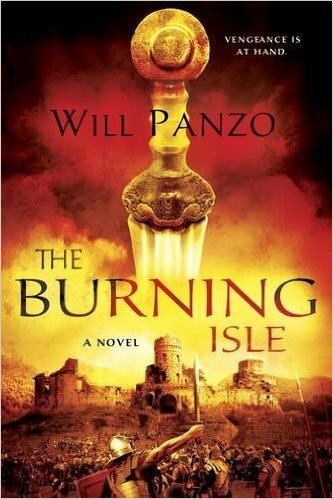 Will Panzo is definitely an author to watch in the future. This “dark and gritty collection” features works from New York Times bestselling authors Jim Butcher, Seanan McGuire, Kevin J. Anderson, and Rob Thurman, as well as Tanya Huff, Kat Richardson, Jim C. Hines, Anton Strout, Lucy A. Snyder, Kristine Kathryn Rusch, and Erik Scott de Bie. It includes Cold Case by Jim Butcher, which is entry number 14.5 in the Dresden Files series and follows Molly Carpenter, Harry Dresden’s apprentice. 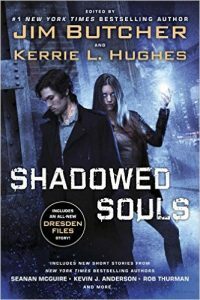 It seems that fantasy and sci-fi anthologies are seeing a rise in popularity recently, and with a Goodreads rating of four-plus stars, Shadowed Souls is definitely a great one to introduce you to some fantastic authors you may not be familiar with. As with most anthologies, the stories are varied enough that you might not love all of them, but you’re sure to find something you like. 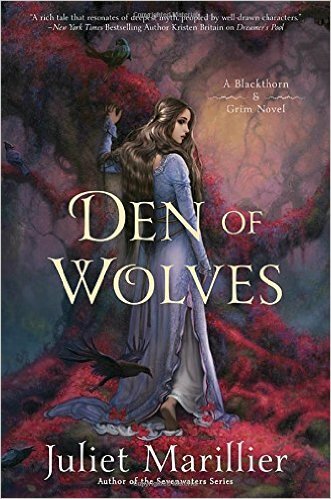 Den of Wolves is the third (and possibly final) installment in the Blackthorn & Grim series from Juliet Marillier, author of the highly popular Sevenwaters novels. The series transports readers to ancient Ireland and follows the adventures of healer Blackthorn and a former prison mate named Grim. 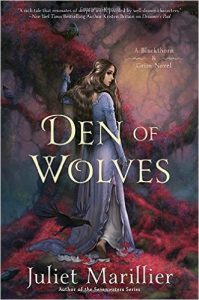 Blackthorn agrees to help the princess of Dalriada care for a troubled young girl named Cara, while Grim is sent to the girl’s home at Wolf Glen to help her wealthy father repair a broken-down house deep in the woods. Grim quickly realizes, however, that not all in Wolf Glen is as it seems. 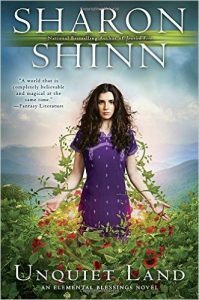 Meanwhile, back at Winterfalls, Blackthorn struggles with the rules of her bonds to the fey when her sworn enemy reopens old wounds. Now, Blackthorn and Grim must choose whether to fight their battles separately, or by one another’s side. Juliet Marillier’s writing is utterly enchanting, and this is a satisfying conclusion to the fantastic trilogy that began with Dreamer’s Pool. Curse on the Land is the second of Faith Hunter’s Soulwood novels, which are set in the same world as her highly acclaimed Jane Yellowrock novels. Soulwood is a series of urban fantasy paranormal police procedurals that follow Nell Ingram, whom Jane Yellowrock referred to PsyLED, a Homeland Security agency responsible for policing paranormals. 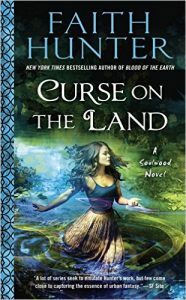 After training, she returns home to the woods she has an arcane connection with to find the land afflicted with a mysterious disease, and the sickness is spreading. Her team, led by agent Rick LaFleur, assists her to find the cause, but they are completly unprepared for what awaits them: an evil entity, thought long dead, that feeds on death. Building on the solid foundation laid in the first book, Blood of the Earth, the second installment is action-packed and full of twists and turns that will keep you engaged until the very end. Nell has developed significantly as a character, and has really bonded with the rest of her team, all of which are interesting characters as well. 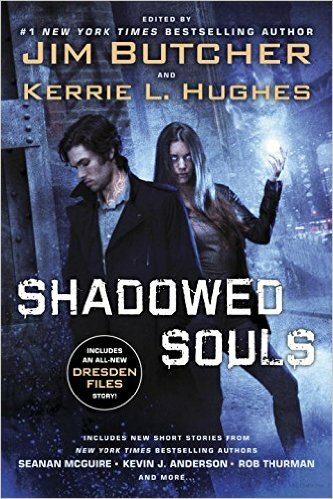 This series is highly recommended for fans of urban fantasy. 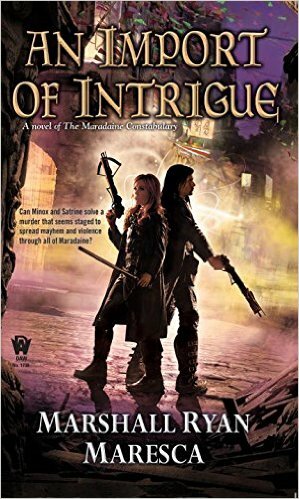 An Import of Intrigue is the second entry in hybrid high fantasy/mystery serious The Maradaine Constabulary by Marshall Ryan Maresca. Satrine Rainey is a former street-rat, ex-spy, and mother who faked her way into a position as a Constabulary Inspector after her husband was gravely injured in said post, and Minox Welling is an Uncircled mage who was partnered with her because no one else wanted to work with either of them. Rainey has since been exposed as a fraud, making her and Welling highly unpopular; however, when a foreign dignitary is murdered and the scene is constructed to point blame at the multicultural neighborhood of Little East, it falls on them to solve the crime. This means Rainey is forced to confront her past, and war threatens to break out in Little East if they don’t solve the case soon. The world is meticulously built and both characters, which were interesting to begin with, show fantastic development in this sequel. If you enjoy police procedurals, high fantasy, and steampunk, consider checking out The Maradaine Constabulary, the first book of which is A Murder of Mages. 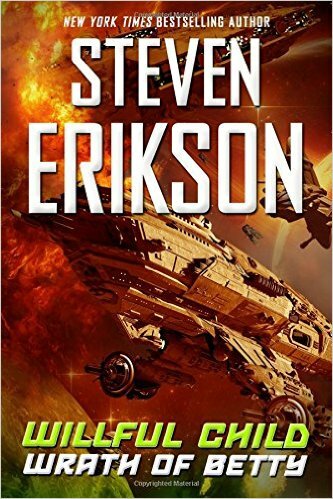 New York Times bestselling author Steven Erikson returns with the second installment in his Star Trek spoof series, which chronicles the adventures of the starship A.S.F. Willful Child and its crew, including the dim-but-cocksure Captain Hadrian Sawback, all while parodying classic sci-fi tropes. 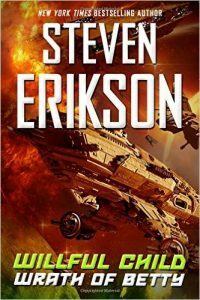 “Its ongoing mission: to seek out strange new worlds on which to plant the Terran flag, to subjugate and if necessary obliterate new life-forms, to boldly blow the…” It’s something entirely different than Malazan Book of the Fallen, and is highly enjoyable if you don’t take it too seriously. It will undoubtedly be humorous to any sci-fi fans, but Trekkies especially will get a chuckle out of many of the references. It won’t be everyone’s cup of tea, as the humor is often over-the-top and slightly juvenile, but if you go in expecting that, it can be an incredibly fun read. If you need a break from all the serious sci-fi and haven’t tried this series yet, we recommend you start with the first book, Willful Child. 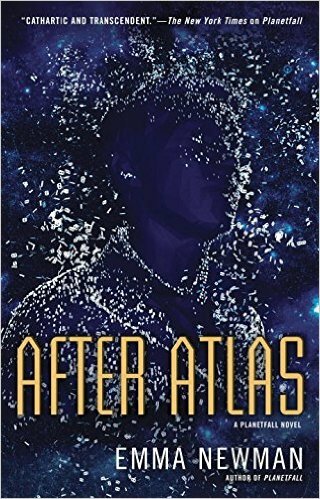 After Atlas is the sequel to the acclaimed novel Planetfall by award-nominated author Emma Newman. However, although it’s set in the same universe as Planetfall, it can be read independently. It’s something of a sci-fi mystery/police procedural (those seem to be popular this month) about Govcorp detective Carlos Moreno, whose entire life changed when Atlas departed Earth; it took away his mother along with his father’s hope and brought him to Alejandro Casales, leader of the religious cult called the Circle and his uncle. He was betrayed by Casales and essentially sold into slavery. Forty years later, Casales is found dead in his hotel room, and Carlos is in charge of the investigation; he must put aside his personal history with Casales in order to solve the case. However, he begins to realize that all is not as it seems, both in the case of Casales’s death and the legacy of Atlas. 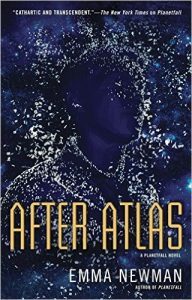 After Atlas provides a very grim look into the future, and fans of Planetfall should enjoy it immensely; however, as mentioned before, having read the first book is not a prerequisite. It’s incredibly dark, but Newman has created an incredibly intriguing cyberpunk world that’s easy to lose yourself in. 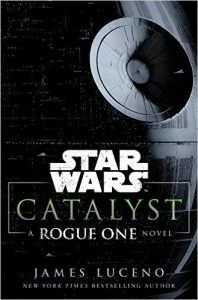 Catalyst: A Rogue One Novel is a prequel to the highly-anticipated film Rogue One: A Star Wars Story and sets the stage for the movie. It focuses on two characters that are instrumental in constructing the Death Star: scientist Galen Erso and Imperial officer Orson Krennic. It also introduces the new heroine of Rogue One, Jyn Erso, as a child. Creative executive Pablo Hidalgo told USA Today that Catalyst will answer some questions about the history of the Death Star, and compares the relationship between Erso and Krennic to that of Steve Jobs and Steve Wozniak. If you’re planning on going to see Rogue One when it hits theaters, you should definitely consider reading this in preparation. 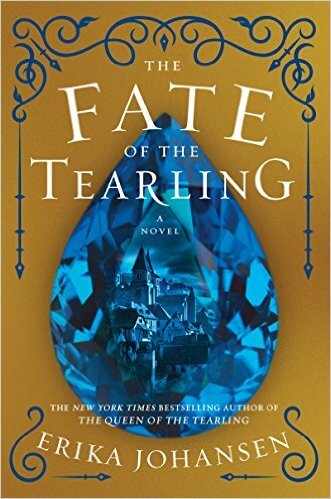 The third and final book in the New York Times bestselling The Queen of the Tearling series, The Fate of the Tearling, is a fitting conclusion to a fantastic series. Kelsea Glynn has come into her own as the Queen of the Tearling, but has gained many enemies along the way, among them the evil Red Queen. The Red Queen prepares to invade the Tear, and to protect her people, Kelsea gives over herself and her magical sapphires, naming the Mace as Regent in her place. The Mace, however, is determined to rescue his Queen from her prison in Mortmesne. The Queen of the Tearling is the kind of YA series that can be enjoyed by readers of all ages, but at its heart is a coming-of-age story about a young girl, and we really see her character grow substantially over the course of the series. If you’re a fan of YA dystopian novels, consider giving this series a try, beginning with The Queen of the Tearling.